Understanding How To Win a Permanent Restraining Order Hearing in Colorado – In order to fully understand how to defend an attempt by an individual – let’s say a former spouse, significant other or angry neighbor – from obtaining what could be a life changing Colorado Permanent Restraining Oder against you – you start with a close analysis of the law itself. Most states refer to restraining orders involving crimes against persons as “protection orders.” The importance and potential impact of these orders is reflected by the fact – for example – that the FBI maintains a protection order file of civil and criminal orders involving domestic violence and stalking in order to assist in interstate enforcement and insta-check gun background check. In the civil restraining/protection order and criminal contexts, the focus is on specific acts of violence that are being alleged. To defend these cases – you MUST begin with a close analysis – paragraph by paragraph, of the actual law. What follows is an ANALYSIS OF THE “NEW” (2013 -2015) COLORADO CIVIL RESTRAINING ORDER LAWS. A Guide To Colorado Civil Restraining – Protection Order Hearings and Procedures – In mid 2013, The Colorado state legislature revamped and re-codified (renumbered) the civil restraining order laws and constructed a process to make obtaining a Permanent Colorado Restraining Order – easier, simpler and clearer for the persons seeking the order. For those opposing these orders – the new laws created additional hardships making it more difficult to stop them in the Colorado Court System. I have drafted a separate article that directly addresses the Modification and Termination of a Colorado Permanent Restraining Order. Follow this LINK. Eliminates all other civil mechanisms for obtaining a protective order in Colorado. Adds sexual assault or abuse as a specific basis for requesting a protective order. Defines “contact” to include new forms of electronic communication. Adds a new section on the impact of restraining orders on the possession or purchase of firearms for some individuals subject to a civil protection order. Increases the maximum agreed-upon extension of a temporary protection order by agreement of the parties from 120 days to one year. Extends the maximum time under which a Title 13 restraining order can award temporary custody and control of a minor child from 120 days to one year. And reduces he time before a restrained party may request a modification or dismissal of a Colorado permanent restraining order from four years down to two years – but then adds several additional tactical roadblocks for persuading a judge to grant the modification. What follows is a lengthy and close analysis of the new statutory scheme. A brief commentary explaining the importance of each critical section and subsection which precedes each section. Other sections may have a brief introduction as to the importance of the internal subsections when that internal section that requires some explanation of that law’s significance as against the entire statutory scheme. A quick note – these laws are complex and can never replace the assistance of an experienced Colorado lawyer who can represent you in the process on either side of the issues. Nine statutes read together have changed the Colorado Civil Protection Order process. The key statutes are Section 13-14-104.5 – the Procedure for Obtaining a TEMPORARY Civil Protection Order and Section 13-14-106 – the Procedure for Obtaining A PERMANENT Civil Protection Order. However all of the laws are included with at least some analysis. [HMS – Section 13-14-100.2. – To understand exactly why the Colorado State Legislature restructured the process for obtaining a permanent restraining order – one needs to closely read the legislation declaration the follows. One should always start with the law itself. Read it and study it to truly understand it. (1) The general assembly hereby finds that the issuance and enforcement of protection orders are of paramount importance in the state of Colorado because protection orders promote safety, reduce violence and other types of abuse, and prevent serious harm and death. In order to improve the public’s access to protection orders and to ensure careful judicial consideration of requests and effective law enforcement, there shall be two processes for obtaining protection orders within the state of Colorado, a simplified civil process and a mandatory criminal process. (2) The general assembly further finds and declares that domestic abuse is not limited to physical threats of violence and harm but also includes mental and emotional abuse, financial control, document control, property control, and other types of control that make a victim more likely to return to an abuser due to fear of retaliation or inability to meet basic needs. Many victims of domestic abuse are unable to access the resources necessary to seek lasting safety options. Victims need additional provisions in protection orders so that they can meet their immediate needs of food, shelter, transportation, medical care, and childcare for their appearance at protection order hearings. These needs may exist not only in cases that may end in dissolution of marriage but also in other circumstances, including cases in which reconciliation may occur. (3) Additionally, the general assembly finds and declares that sexual assault affects Coloradans of all ages, backgrounds, and circumstances and is one of the most underreported of all crimes. Sexual violence may occur in any type of relationship; however, the majority of sexual assault is perpetrated by someone whom the victim knows. Victims of sexual assault who do not report the crime, as well as victims who do report but whose case is not prosecuted, still need and deserve protection from future interactions with the perpetrator, as many victims experience long-lasting physical and emotional trauma from unwanted contact with the perpetrator. (4) Finally, the general assembly finds and declares that stalking is a dangerous, high-risk crime that frequently escalates over time and that sometimes leads, tragically, to sexual assault or homicide. Countless youth and adults in Colorado have faced the fear, isolation, and danger of being victims of stalking, and many of these incidents go unreported and are not prosecuted. While stalking behaviors may appear innocuous to outside observers, the victims often endure intense physical and emotional distress that affects all aspects of their lives and are more likely than others to express anxiety, depression, and social dysfunction. (f) Constitute threats or acts of violence against, or the taking, transferring, concealing, harming, or disposing of, an animal owned, possessed, leased, kept, or held by the elderly or at-risk adult, which threats or acts are intended to coerce, control, punish, intimidate, or exact revenge upon the elderly or at-risk adult. (1.5) “Adult” means a person eighteen years of age or older. (1.7) “Contact” or “contacting” means any interaction or communication with another person, directly or indirectly through a third party, and electronic and digital forms of communication, including but not limited to interaction or communication through social media. (2) “Domestic abuse” means any act, attempted act, or threatened act of violence, stalking, harassment, or coercion that is committed by any person against another person to whom the actor is currently or was formerly related, or with whom the actor is living or has lived in the same domicile, or with whom the actor is involved or has been involved in an intimate relationship. A sexual relationship may be an indicator of an intimate relationship but is never a necessary condition for finding an intimate relationship. For purposes of this subsection (2), “coercion” includes compelling a person by force, threat of force, or intimidation to engage in conduct from which the person has the right or privilege to abstain, or to abstain from conduct in which the person has a right or privilege to engage. (2.2) “Minor child” means a person under eighteen years of age. (2.3) “Protected person” means the person or persons identified in a protection order as the person or persons for whose benefit the protection order was issued. [HMS – Section Sections (I) – (IV) – make clear that the standards and factors outlined in these laws apply to all other types of restraining orders – civil, juvenile and criminal including municipal bases restraining orders]. (IV) Any other order of a court that prohibits a person from contacting, harassing, injuring, intimidating, molesting, threatening, touching, stalking, or sexually assaulting or abusing a person, or from entering or remaining on premises, or from coming within a specified distance of a protected person or premises, or from taking, transferring, concealing, harming, disposing of or threatening to harm an animal owned, possessed, leased, kept, or held by a person, or from entering or remaining on premises, or from coming within a specified distance of a protected person or premises. (b) For purposes of this article only, “protection order” includes any order that amends, modifies, supplements, or supersedes the initial protection order. “Protection order” also includes any emergency protection order, as described in section 13-14-103, any restraining order entered prior to July 1, 2003, and any foreign protection order as defined in section 13-14-110. (2.8) “Restrained person” means a person identified in a protection order as a person prohibited from doing a specified act or acts. (2.9) “Sexual assault or abuse” means any act, attempted act, or threatened act of unlawful sexual behavior, as described in section 16-11.7-102(3), C.R.S., by any person against another person regardless of the relationship between the actor and the petitioner. (3) “Stalking” means any act, attempted act, or threatened act of stalking as described insection 18-3-602, C.R.S. (b) To be eligible for a protection order, the petitioner does not need to show that he or she has reported the act that is the subject of the complaint to law enforcement, that charges have been filed, or that the petitioner is participating in the prosecution of a criminal matter. (3) Venue for filing a motion or complaint pursuant to this section is proper in any county where the acts that are the subject of the motion or complaint occur, in any county where one of the parties resides, or in any county where one of the parties is employed. This requirement for venue does not prohibit the change of venue to any other county appropriate under applicable law. (5) Any district court, in an action commenced under the “Uniform Dissolution of Marriage Act”, article 10 of title 14, C.R.S., shall have authority to issue temporary and permanent protection orders pursuant to the provisions of subsection (1) of this section. Such protection order may be as a part of a motion for a protection order accompanied by an affidavit filed in an action brought under article 10 of title 14, C.R.S. Either party may request the court to issue a protection order consistent with any other provision of this article. (6) At the time a protection order is requested pursuant to this section, the court shall inquire about, and the requesting party and such party’s attorney shall have an independent duty to disclose, knowledge such party and such party’s attorney may have concerning the existence of any prior protection or restraining order of any court addressing in whole or in part the subject matter of the requested protection order. In the event there are conflicting restraining or protection orders, the court shall consider, as its first priority, issues of public safety. An order that prevents assaults, threats of assault, or other harm shall be given precedence over an order that deals with the disposition of property or other tangible assets. Every effort shall be made by judicial officers to clarify conflicting orders. [HMS – § 13-14-104.5. (7) – this subsection is the KEY sub-section of this section. It sets out the procedures and “tests” and standards to be applied before the Court may issue the TRO. The law requires a Judge to find an immanent danger “an imminent danger exists to the life or health of one or more persons,” before issuing the TRO. In the same paragraph the law provides that the basis for that immanency need not be recent – some see this as contradictory language. ](7) (a) A temporary civil protection order may be issued if the issuing judge or magistrate finds that an imminent danger exists to the person or persons seeking protection under the civil protection order. In determining whether an imminent danger exists to the life or health of one or more persons, the court shall consider all relevant evidence concerning the safety and protection of the persons seeking the protection order. The court shall not deny a petitioner the relief requested because of the length of time between an act of abuse or threat of harm and the filing of the petition for a protection order. (b) If the judge or magistrate finds that an imminent danger exists to the employees of a business entity, he or she may issue a civil protection order in the name of the business for the protection of the employees. An employer is not be liable for failing to obtain a civil protection order in the name of the business for the protection of the employees and patrons. (8) Upon the filing of a complaint duly verified, alleging that the respondent has committed acts that would constitute grounds for a civil protection order, any judge or magistrate, after hearing the evidence and being fully satisfied therein that sufficient cause exists, may issue a temporary civil protection order to prevent the actions complained of and a citation directed to the respondent commanding the respondent to appear before the court at a specific time and date and to show cause, if any, why said temporary civil protection order should not be made permanent. In addition, the court may order any other relief that the court deems appropriate. Complaints may be filed by persons seeking protection for themselves or for others as provided in section 26-3.1-102(1) (b) and (1) (c), C.R.S. (9) A copy of the complaint, a copy of the temporary civil protection order, and a copy of the citation must be served upon the respondent and upon the person to be protected, if the complaint was filed by another person, in accordance with the rules for service of process as provided in rule 304 of the rules of county court civil procedure or rule 4 of the Colorado rules of civil procedure. The citation must inform the respondent that, if the respondent fails to appear in court in accordance with the terms of the citation, a bench warrant may be issued for the arrest of the respondent, and the temporary protection order previously entered by the court made permanent without further notice or service upon the respondent. (10) The return date of the citation must be set not more than fourteen days after the issuance of the temporary civil protection order and citation. If the petitioner is unable to serve the respondent in that period, the court shall extend the temporary protection order previously issued, continue the show of cause hearing, and issue an alias citation stating the date and time to which the hearing is continued. The petitioner may thereafter request, and the court may grant, additional continuances as needed if the petitioner has still been unable to serve the respondent. (11) (a) Any person against whom a temporary protection order is issued pursuant to this section, which temporary protection order excludes the person from a shared residence, is permitted to return to the shared residence one time to obtain sufficient undisputed personal effects as are necessary for the person to maintain a normal standard of living during any period prior to a hearing concerning the order. The person against whom a temporary protection order is issued is permitted to return to the shared residence only if the person is accompanied at all times by a peace officer while the person is at or in the shared residence. (b) When any person is served with a temporary protection order issued against the person excluding the person from a shared residence, the temporary protection order must contain a notification in writing to the person of the person’s ability to return to the shared residence pursuant to paragraph (a) of this subsection (11). The written notification shall be in bold print and conspicuously placed in the temporary protection order. A judge, magistrate, or other judicial officer shall not issue a temporary protection order that does not comply with this section. (c) Any person against whom a temporary protection order is issued pursuant to this section, which temporary protection order excludes the person from a shared residence, may avail himself or herself of the forcible entry and detainer remedies available pursuant to article 40 of this title. However, such person is not entitled to return to the residence until such time as a valid writ of restitution is executed and filed with the court issuing the protection order and, if necessary, the protection order is modified accordingly. A landlord whose lessee has been excluded from a residence pursuant to the terms of a protection order may also avail himself or herself of the remedies available pursuant to article 40 of this title. (I) Awarding temporary care and control of any minor children of either party involved for a period of not more than one year. (II) If temporary care and control is awarded, the order may include parenting time rights for the other party involved and any conditions of such parenting time, including the supervision of parenting time by a third party who agrees to the terms of the supervised parenting time and any costs associated with supervised parenting time, if necessary. If the restrained party is unable to pay the ordered costs, the court shall not place such responsibility with publicly funded agencies. If the court finds that the safety of any child or the protected party cannot be ensured with any form of parenting time reasonably available, the court may deny parenting time. (III) The court may award interim decision-making responsibility of a child to a person entitled to bring an action for the allocation of parental responsibilities under section 14-10-123, C.R.S., when such award is reasonably related to preventing domestic abuse as defined in section 13- 14-101(2), or preventing the child from witnessing domestic abuse. (IV) Temporary care and control or interim decision-making responsibility must be determined in accordance with the standard contained in section 14-10- 124, C.R.S. (j) (I) Entering a temporary injunction restraining the respondent from ceasing to make payments for mortgage or rent, insurance, utilities or related services, transportation, medical care, or child care when the respondent has a prior existing duty or legal obligation or from transferring, encumbering, concealing, or in any way disposing of personal effects or real property, except in the usual course of business or for the necessities of life and requiring the restrained party to account to the court for all extraordinary expenditures made after the injunction is in effect. (II) Any injunction issued pursuant to this paragraph (j) is effective upon personal service or upon waiver and acceptance of service by the respondent for a period of time determined appropriate by the court not to exceed one year after the issuance of the permanent civil protection order. (III) The provisions of the injunction must be printed on the summons, and the petition and the injunction become an order of the court upon fulfillment of the requirements of subparagraph (I) of this paragraph (j). (IV) Nothing in this paragraph (j) precludes either party from applying to the district court for further temporary orders, an expanded temporary injunction, or modification or revocation. Any subsequent order issued by the district court as part of a domestic matter involving the parties supersedes an injunction made pursuant to this paragraph (j). (2) Any order for temporary care and control issued pursuant to subsection (1) of this section is governed by the “Uniform Child-custody Jurisdiction and Enforcement Act”, article 13 of title 14, C.R.S. [HMS – § 13-14-106 – this is the KEY SECTION that discusses the procedures and processes that govern the transformation of the TRO into a PRO. It is the most significant Section in this group of laws governing Permanent Restraining orders. It delineates the burden of proof on the Petitioner – a preponderance of the evidence and that the It requires the Judge to make a “finding” – a specific ruling as to why the restraining order is needed. It specifies the kind of proof necessary to order a permanent restraining order which adds new elements previously not a part of the mix of options available to the Petitioner. Finally, and most importantly, under subsection (l)(a) “[a] finding of imminent danger to the protected person is not a necessary prerequisite to the issuance of a permanent civil protection order.” The requirement of a finding of “imminent danger” ONLY applies to the TRO – it no longer applies to the PRO. “Imminence” now is not a “necessary prerequisite” to making the TRO permanent. (1) (a) On the return date of the citation, or on the day to which the hearing has been continued, the judge or magistrate shall examine the record and the evidence. If upon such examination the judge or magistrate finds by a preponderance of the evidence that the respondent has committed acts constituting grounds for issuance of a civil protection order and that unless restrained will continue to commit such acts or acts designed to intimidate or retaliate against the protected person, the judge or magistrate shall order the temporary civil protection order to be made permanent or enter a permanent civil protection order with provisions different from the temporary civil protection order. A finding of imminent danger to the protected person is not a necessary prerequisite to the issuance of a permanent civil protection order. The judge or magistrate shall inform the respondent that a violation of the civil protection order constitutes a criminal offense pursuant to section 18-6-803.5, C.R.S., or constitutes contempt of court and subjects the respondent to such punishment as may be provided by law. If the respondent fails to appear before the court for the show cause hearing at the time and on the date identified in the citation issued by the court and the court finds that the respondent was properly served with the temporary protection order and such citation, it is not necessary to re-serve the respondent to make the protection order permanent. However, if the court modifies the protection order on the motion of the protected party, the modified protection order must be served upon the respondent. (b) Notwithstanding the provisions of paragraph (a) of this subsection (1), the judge or magistrate, after examining the record and the evidence, for good cause shown, may continue the temporary protection order and the show cause hearing to a date certain not to exceed one year after the date of the hearing if he or she determines such continuance would be in the best interests of the parties and if both parties are present at the hearing and agree to the continuance. In addition, each party may request one continuance for a period not to exceed fourteen days, which the judge or magistrate, after examining the record and the evidence, may grant upon finding of good cause. The judge or magistrate shall inform the respondent that a violation of the temporary civil protection order constitutes a criminal offense pursuant to section 18-6-803.5, C.R.S., or constitutes contempt of court and subjects the respondent to such punishment as may be provided by law. (c) Notwithstanding the provisions of paragraph (b) of this subsection (1), for a protection order filed in a proceeding commenced under the “Uniform Dissolution of Marriage Act”, article 10 of title 14, C.R.S., the court may, on the motion of either party if both parties agree to the continuance, continue the temporary protection order until the time of the final decree or final disposition of the action. (2) The court shall electronically transfer into the central registry of protection orders established pursuant to section 18-6-803.7, C.R.S., a copy of any order issued pursuant to this section and shall deliver a copy of such order to the protected party. (3) A court shall not grant a mutual protection order to prevent domestic abuse for the protection of opposing parties unless each party has met his or her burden of proof as described in section 13-14-104.5(7) and the court makes separate and sufficient findings of fact to support the issuance of the mutual protection order to prevent domestic abuse for the protection of opposing parties. A party may not waive the requirements set forth in this subsection (3). (1) A person failing to comply with any order of the court issued pursuant to this article is in ontempt of court or may be prosecuted for violation of a civil protection order pursuant to section 18-6-803.5, C.R.S. (2) The duties of peace officers enforcing a civil protection order shall be in accordance with section 18-6-803.5, C.R.S., and any rules adopted by the Colorado supreme court pursuant to that section. (3) If a respondent has not been personally served with a protection order, a peace officer responding to a call for assistance shall serve a copy of the protection order on the respondent named in the protection order, shall write the time, date, and manner of service on the protected person’s copy of the order, and shall sign the statement. § 13-14-108. Modification and Termination of Civil Protection Orders. (1) Any order granted pursuant to section 13-14-105(1) (c) or (1) (e) must terminate whenever a subsequent order regarding the same subject matter is granted pursuant to the “Uniform Dissolution of Marriage Act”, article 10 of title 14, C.R.S., the “Uniform Child-custody Jurisdiction and Enforcement Act”, article 13 of title 14, C.R.S., or the “Colorado Children’s Code”, title 19, C.R.S. (2) (a) Nothing in this article precludes the protected party from applying to the court at any time for modification, including but not limited to a modification of the duration of a protection order or dismissal of a temporary or permanent protection order issued pursuant to this section. (b) The restrained party may apply to the court for modification, including but not limited to a modification of the duration of the protection order or dismissal of a permanent protection order pursuant to this section. However, if a permanent protection order has been issued or if a motion for modification or dismissal of a permanent protection order has been filed by the restrained party, whether or not it was granted, no motion to modify or dismiss may be filed by the restrained party within two years after issuance of the permanent order or after disposition of the prior motion. (3) (a) (I) Notwithstanding any provision of subsection (2) of this section to the contrary, after issuance of the permanent protection order, if the restrained party has been convicted of or pled guilty to any misdemeanor or any felony against the protected person, other than the original offense, if any, that formed the basis for the issuance of the protection order, then the protection order remains permanent and must not be modified or dismissed by the court. (II) Notwithstanding the prohibition in subparagraph (I) of this paragraph (a), a protection order may be modified or dismissed on the motion of the protected person, or the person’s attorney, parent or legal guardian if a minor, or conservator or legal guardian if one has been appointed; except that this paragraph (a) does not apply if the parent, legal guardian, or conservator is the restrained person. (b) A court shall not consider a motion to modify a protection order filed by a restrained party pursuant to paragraph (a) of this subsection (3) unless the court receives the results of a fingerprint-based criminal history record check of the restrained party that is conducted within ninety days prior to the filing of the motion. The fingerprint-based criminal history record check must include a review of the state and federal criminal history records maintained by the Colorado bureau of investigation and federal bureau of investigation. The restrained party shall be responsible for supplying fingerprints to the Colorado bureau of investigation and to the federal bureau of investigation and paying the costs of the record checks. The restrained party may be required by the court to provide certified copies of any criminal dispositions that are not reflected in the state or federal records and any other dispositions that are unknown. (4) Except as otherwise provided in this article, the issuing court retains jurisdiction to enforce, modify, or dismiss a temporary or permanent protection order. (5) The court shall hear any motion filed pursuant to subsection (2) of this section. The party moving for a modification or dismissal of a temporary or permanent protection order pursuant to subsection (2) of this section shall affect personal service on the other party with a copy of the motion and notice of the hearing on the motion, as provided by rule 4 (e) of the Colorado rules of civil procedure. The moving party shall bear the burden of proof to show, by a preponderance of the evidence, that the modification is appropriate or that a dismissal is appropriate because the protection order is no longer necessary. If the protected party has requested that his or her address be kept confidential, the court shall not disclose such information to the restrained party or any other person, except as otherwise authorized by law. (j) Whether the continued safety of the protected person depends upon the protection order remaining in place because the order has been successful in preventing further harm to the protected person. Here are some links that can help you start the process for modifying and or lifting a Colorado civil protection order. (1) The court may assess a filing fee against a petitioner seeking relief under this article; except that the court may not assess a filing fee against a petitioner if the court determines the petitioner is seeking the protection order as a victim of domestic abuse, domestic violence as defined in section 18-6-800.3(1), C.R.S., stalking, or sexual assault or abuse. The court shall provide the necessary number of certified copies at no cost to petitioners. Domestic abuse, domestic violence as defined in section 18-6-800.3(1), C.R.S., stalking, or sexual assault or abuse. (3) At the permanent protection order hearing, the court may require the respondent to pay the filing fee and service-of-process fees, as established by the state agency, political subdivision, or public agency pursuant to a fee schedule, and to reimburse the petitioner for costs incurred in bringing the action. § 13-14-110. Foreign Protection Orders. (1) Definitions. As used in this section, “foreign protection order” means any protection or restraining order, injunction, or other order issued for the purpose of preventing violent or threatening acts or harassment against, or contact or communication with or physical proximity to, another person, including temporary or final orders, other than child support or custody orders, issued by a civil or criminal court of another state, an Indian tribe, or a United States territory or commonwealth. (a) The foreign protection order was obtained after providing the person against whom the protection order was sought reasonable notice and an opportunity to be heard sufficient to protect his or her due process rights. If the foreign protection order is an ex parte injunction or order, the person against whom it was obtained must have been given notice and an opportunity to be heard within a reasonable time after the order was issued sufficient to protect his or her due process rights. (c) The order complies with section 13-14-106(3). (3) Process. A person entitled to protection under a foreign protection order may, but is not required to, file such order in the district or county court by filing with such court a certified copy of such order, which must be entered into the central registry of protection orders created in section 18-6-803.7, C.R.S. The certified order must be accompanied by an affidavit in which the protected person affirms to the best of his or her knowledge that the order has not been changed or modified since it was issued. There shall be no filing fee charged. It is the responsibility of the protected person to notify the court if the protection order is subsequently modified. (4) Enforcement. Filing of the foreign protection order in the central registry or otherwise domesticating or registering the order pursuant to article 53 of this title or section 14-11- 101, C.R.S., is not a prerequisite to enforcement of the foreign protection order. A peace officer shall presume the validity of, and enforce in accordance with the provisions of this article, a foreign protection order that appears to be an authentic court order that has been provided to the peace officer by any source. If the protected party does not have a copy of the foreign protection order on his or her person and the peace officer determines that a protection order exists through the central registry, the national crime information center as described in 28 U.S.C. sec. 534, or through communication with appropriate authorities, the peace officer shall enforce the order. A peace officer may rely upon the statement of any person protected by a foreign protection order that it remains in effect. A peace officer who is acting in good faith when enforcing a foreign protection order is not civilly liable or criminally liable pursuant to section 18-6-803.5(5), C.R.S. You should be careful to make a responsible choice in selecting a Colorado Criminal Defense Lawyer – and we encourage you to “vet” our firm. Over the last 30 plus years – by focusing ONLY on Colorado criminal law – H. Michael has had the necessary time to commit to the task of constantly updating himself on nearly every area of criminal law, to include Colorado criminal law and procedure and trial and courtroom practice. H. Michael works hard to get his clients the best possible results in and out of the courtroom. 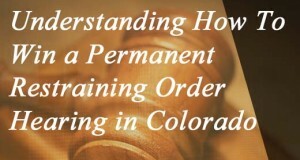 He has written, and continues to write, extensively on Colorado criminal law and he hopes this article helps you in some small way Understanding How To Win a Permanent Restraining Order Hearing in Colorado. In mid 2013, The Colorado state legislature revamped and re-codified (renumbered) the civil restraining order laws and constructed a process to make obtaining a Permanent Colorado Restraining Order - easier, simpler and clearer for the persons seeking the order. For those opposing these orders - the new laws created additional hardships making it more difficult to stop them in the Colorado Court System.